The first time I had a pomegranate, way back in 2007 before I knew what a blog was and when my pants used to fit, I was disappointed. I wasn’t sure what to expect, but didn’t think I’d experience a plethora of little fuschia seeds. This was long before pomegranate-cutting tutorials were aplenty. Okay, there probably were millions of pomegranate tutorials, but I had much more of a life back then and it did not include wasting my life away on the internet. My… how times have changed. Since discovering this delicious, vibrant and quite expensive fruit, I’ve done nothing short of throwing it into every recipe I can get my hands on. Especially when it comes to desserts. But those desserts tend to be cheesecakes and ice creams and treats that are sprinkled with the arils. I wanted to make a sweet with the arils inside: double fudgy chocolate cookies stuffed with gooey chocolate chips and studded with pomegranate jewels. You don’t get an overwhelming pomegranate flavor with each bite, but you do get a tart “pop” of juice when you come upon a seed. 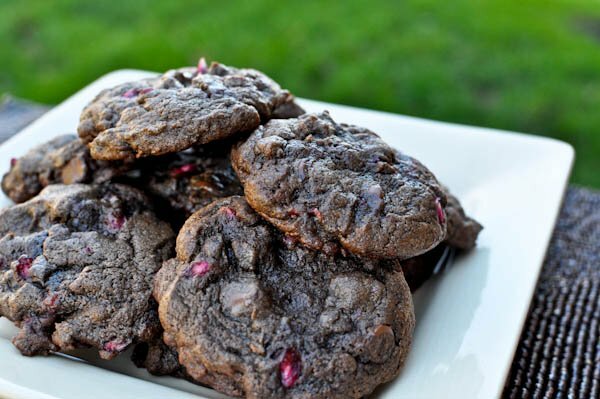 The arils remain juicy through baking and add such a delicious texture to the cookie. And it also gives them a splash of pink color. I’m all over that. Cream butter, sugar, eggs and vanilla until fluffy. Add flour, cocoa powder, baking soda and salt, then pomegranate juice and mix until combined. Fold in chocolate chips and arils. Refrigerate dough for 2-4 hours (or more). When ready to bake, preheat oven to 350, roll into balls and set on baking sheet. Bake at 350 for 8-10 minutes. Let cool completely. Wasting my day away is so worth it for this. PS -> there is Facebook giveaway going on! These looks like heaven, but I can’t find fresh pomegranates very easily in my neck of the woods. However, I did find dehydrated pomegranate seeds in an Indian market today. Do you think they would work? They didn’t look totally dry, there was some moisture in the bag and arils. Is it worth a shot? i’m trying so hard not to lick my computer screen right now. These were delicious! I didn’t have pomegranate juice so I substituted Balsamic Vinegar. Super tasty! Look really really good!!! Pomegranate are a miracle food: they are a very high source of anti-oxidants! These sound so good! I absolutely love pomegranates, but like you I sprinkle them on salads or other foods. The combination of pomegranate and chocolate would be really good! I tried this recipe today and your cookies look so much better than mine. Maybe I mixed it too much or didn’t leave them in the fridge long enough. Who knows. I will try it again because they still tasted good and I loved having the seeds pop. They went too flat. Thanks for sharing! how many pomegranates should i buy? how many did you use to make a half cup? thanks! can’t wait to bake them! Mmm, these look so amazing! Thanks for sharing the recipe. I can’t wait to try them! I just put a batch in the oven and I can wait till they are done! I send a update later and you have somw great recipes on here I wish I had time too cook them all!!! Pingback: 36 Cookies and Bars Perfect for Holiday Parties or Gifts!